Kerstin Brätsch and United Brothers wear Lavaprisms for MaxMara. Courtesy MaxMara. Collectively, that's a lot of corporate energy and trust being funnelled into art. The MaxMara Art Prize for Women went to Helen Cammock, whose multimedia work composes narratives of marginalized voices and the black experience. This is a rather unique prize for a couple reasons: first, it's demographically limited (women based in the United Kingdom who have not had a retrospective); second, its jury judges proposals, not completed work; and, third, the prize is a residency at which the proposal becomes a work. These are all rare attributes that define the goals of the prize, and also reflect the values of the brand in a coherent way. WWD announces the prize. Cammock will be headed to Italy for six months, where she will research female emotions in art history. Frieze reports on the proposal. 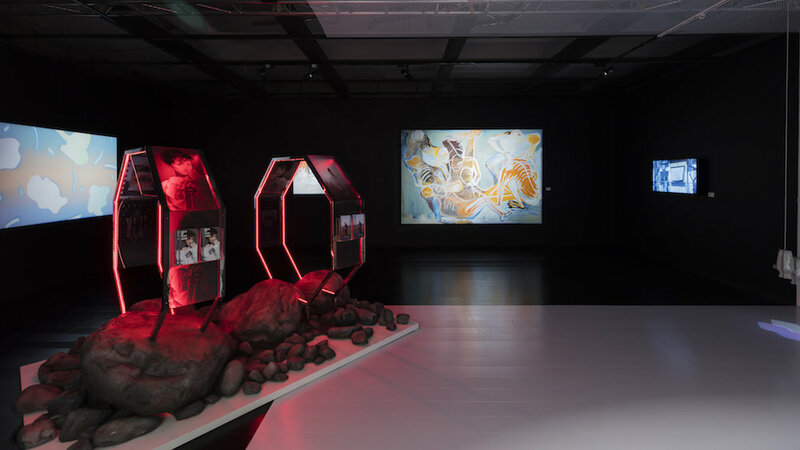 Like many of the best art prizes, this one is awarded in concert with an Institution (the Whitechapel Gallery), and draws on the expertise of an art world jury intimately tied to the target demographic (gallerist Vanessa Carlos, artist Laure Prouvost, and several others). Meanwhile, at the Salone del Mobile, also in Italy, MaxMara also tapped artists Kerstin Brätsch and Ei Arakawa (under the moniker of his collective, United Brothers) to create a limited edition pair of sunglasses called Lavaprisms, based on a combined concept of Brätsch's work with glass as a medium and the Brothers' ongoing engagement with the nuclear meltdown in Fukushima. Wallpaper shares the visuals. MaxMara typically (though not exclusively) collaborates with women artists (last year's sunglasses were with Shantell Martin), in another reflection of its brand values. So which project succeeds? If Google and Instagram results are anything to go by, the prize earned far more mentions and buzz in the media, with more than seven times the number of results. Anecdotally, we seem to be witnessing brand collaborations working best when artists are encouraged to remain on their own turf, and brands support their works on negotiated terms, rather than scenarios in which artists are commissioned to create products or environments in a more traditionally marketing-oriented sense. Work from the Fosun collection in "A World in a Grain of Sand" at the Atlantis resort in Sanya. Courtesy Fosun Foundation.